MS Access CRM is a Full Featured Professionally Developed CRM Database Designed to Run Any Type of Business. The Database is Compatible with Microsoft Access Versions 2007, 2010, 2013 and the 2016 Desktop Version. You Can Have a Full Featured Business Management System Up and Running in No Time Flat! The CRM System Can be Used as Provided or Can Be Customized to Suit Your Most Demanding Needs. 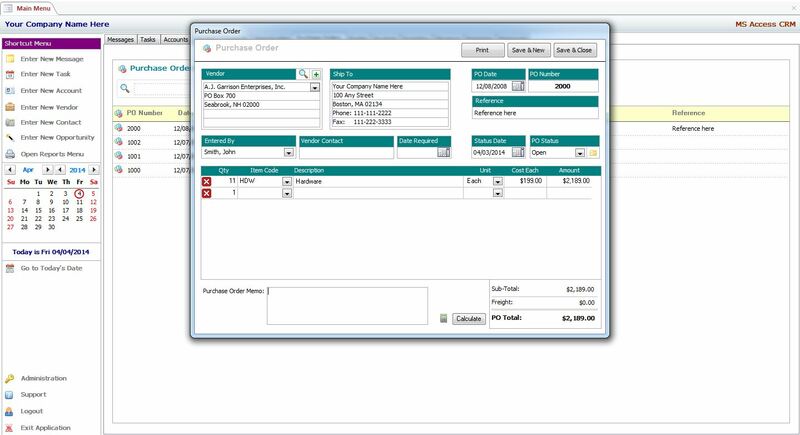 The CRM Database Features an Innovative and User Friendly Tabbed Menu Interface that Automatically Scales to Various Monitors and Screen Sizes. Imagine Having a Full Featured Business Management System Up and Running in Less Than 30 Minutes! 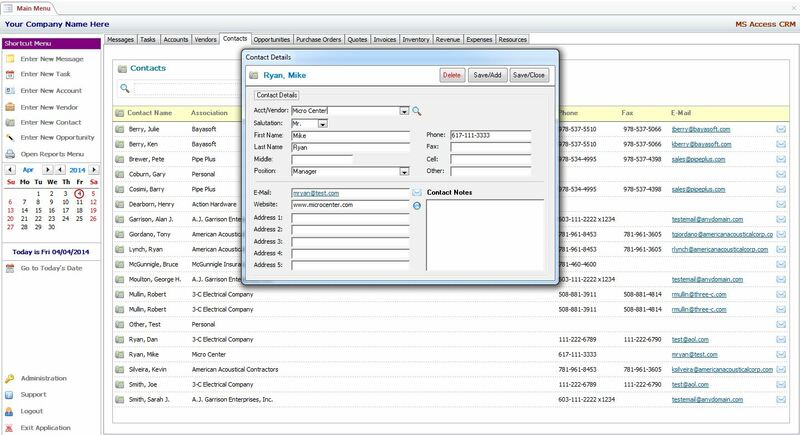 MS Access CRM is a Template Developed in 100% Microsoft Access and Requires No Third Party Controls or Add-Ons. The CRM Database is Offered in Several Configurations and Can Be Used on a Single PC or Shared With Unlimited Multiple Users Over a Network. The Database May Be Run Installed As a a Single File or May Be Split Into a Front End and a Back End, Depending On Your Needs and Number of Users. Our Developer Version Allows Professional Developers, Computer Consultants and Programmers to Customize and Distribute Custom CRM Database Applications to Unlimited Clients and Users. We Have Used this Proven CRM Database as a Base For Our Custom Developed High-End Applications for Over 10 Years in Many Industries. A Licensed Copy of MS Access 2007, 2010, 2013 or 2016 Desktop Version is Required to Run the Database. Contact Us with Any Questions You May Have or to Schedule a Free Demo via Remote Connection. We Will Walk You Thru All Features of the Software. 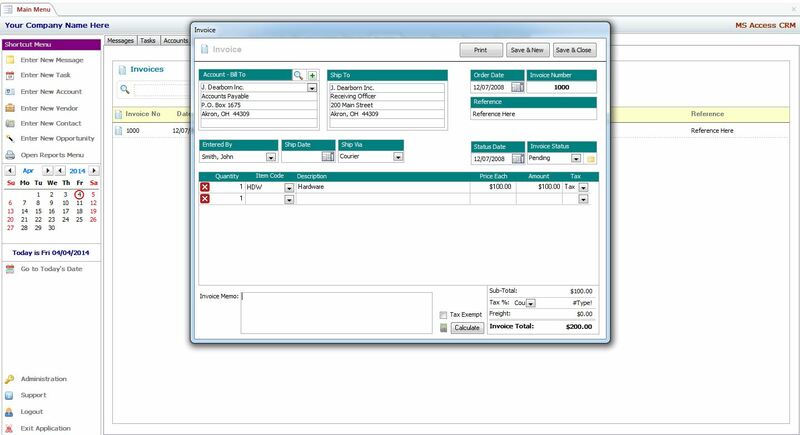 Be Sure to View the Screenshots Below To See Full Size Images of the CRM System. 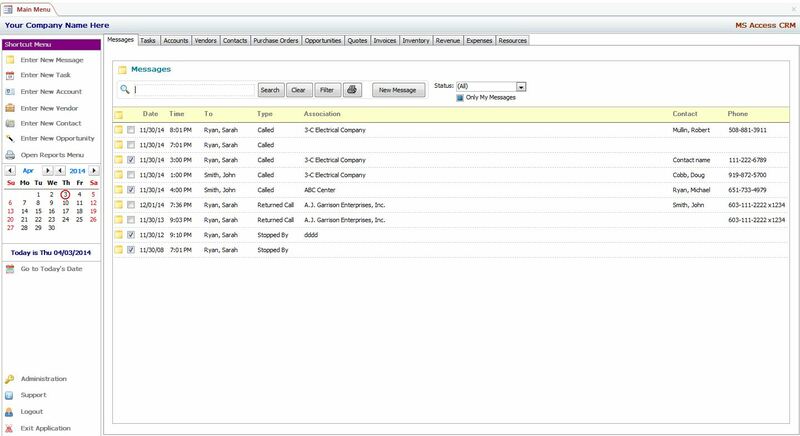 MS Access CRM is Ready to Use As-Is or is Fully Customizable by Advanced MS Access Users, Computer Consultants and Experienced Programmers. If You Need Special Features, We Offer Fee Based Support to Advanced Users, Computer Consultants and Experienced Programmers Along with Fee Based Customization Services for Small and Large Businesses. Contact Us For a FREE Quotation to Provide Support or to Customize the CRM Database to Suit Your Needs. 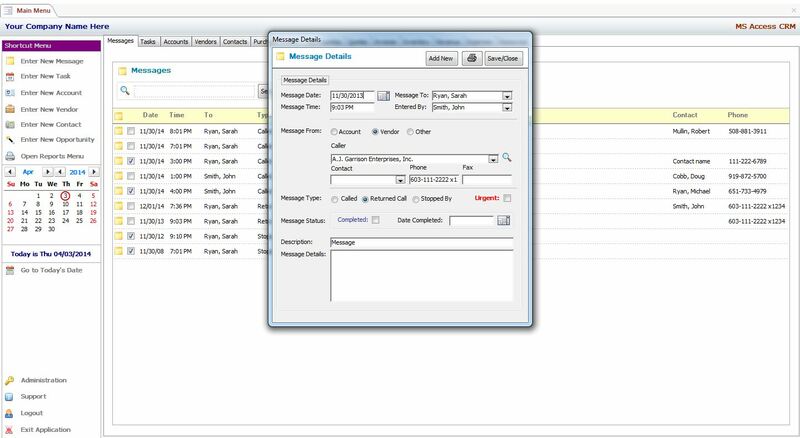 While the MS Access CRM Database Template is Easy to Install and Use With the Instructions Provided, We Offer and Recommend That You take Advantage Of Our Free Technical Support to Setup and Install the Database, Either by Remote Connection, E-Mail and/or Telephone (by scheduled appointment only). We Want You to Get the Software Installed and Setup Properly. Free Technical Support is Limited to the Initial Database Setup and Installation, Including Properly Setting Microsoft Access Options and Security Settings. We Do Not Offer Free Support for Pre-Existing Technical Issues, Hardware and System Configuration Issues, Software Issues, Printer Issues or Network Related Issues. Upon Purchase, We Will Coordinate the Installation and Setup with You or Someone from Your IT Department. 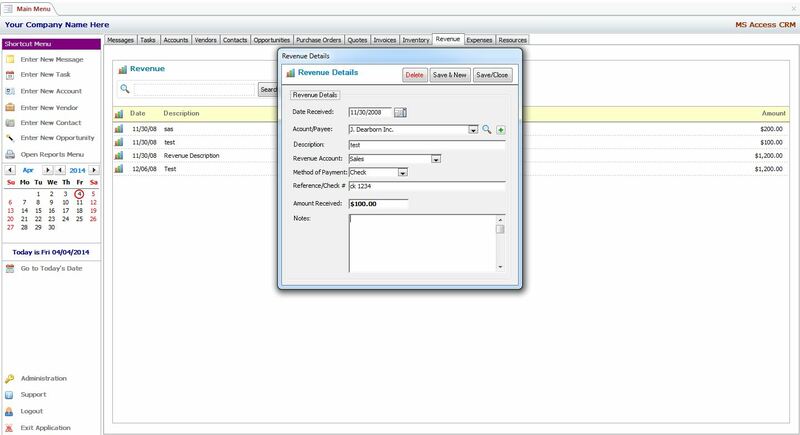 While the MS Access CRM Database Template is Customizable by an Advanced MS Access User, Computer Consultant or Experienced Programmer, We Also Offer Fee Based Support. We Can Provide a FREE Quotation for Technical Support, or to Customize the MS Access CRM Database to Suit Your Needs. 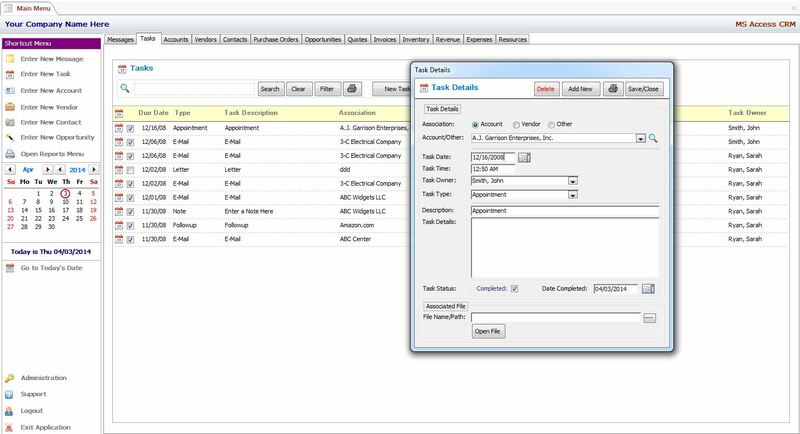 If You Have an Existing CRM or Data Management System, a MS Access Based System or If You Are are Currently Managing Data in MS Excel, FileMaker Pro or Any Other Database, We Have The Experience to Extract and Import Your Existing Data Into MS Access CRM. Contact Us With Details of Any Existing Systems or Data for a Free Quote. Purchase the Version Which Suits You Best. The MS Access CRM Database Template is Delivered as a Digital Download, and Includes Installation and Setup instructions. If You Need Assistance Installing and Configuring the MS Access CRM Database, We Will Schedule a Date and Time to Assist You, Free of Charge. Feel Free to Contact Us with Any Questions or Issues Prior to Purchase. 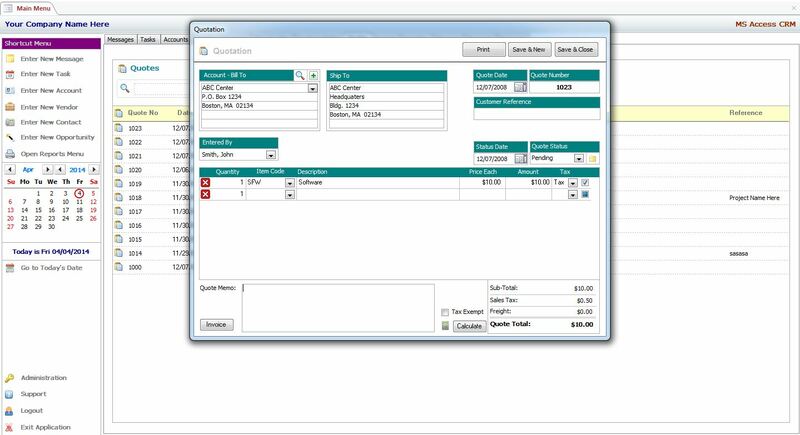 The Single or Multi-User Version is Perfect for a Consultant, Entrepreneur or Those Who Own and Manage Service Industries Like Accountants, Plumbers, Attorneys, Landscapers and Others Where One or More Users Will Be Using the Software. The Single/Multi-User Version Includes User and Password Management Functionality with 2 User Levels. 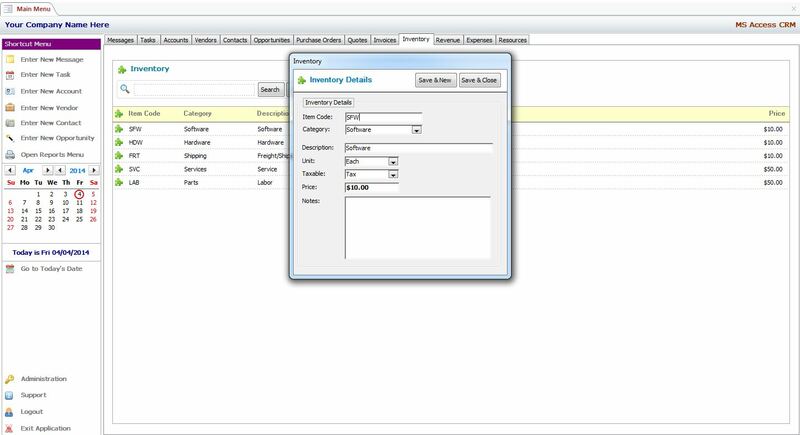 Single/Multi-User License is For One Customizable and Editable Copy of The Software to be Used by One Company or Entity Only with Either One or an Unlimited Number of Users. The Developer License Version is Best for Programmers and Consultants Who Wish to Use the CRM Database As-Is, or Customize it in Order to Develop Custom Solutions for Their Clients. Developer License Includes All Multi-User Features and Rights to Customize and Distribute The Software to Unlimited Clients and Users with No Additional Licensing Costs. Warrantee is Limited to the Functionality of the Software as Provided. No Warranty is Expressed or Implied if Purchaser Customizes or Modifies the Software After Purchase Since we Cannot Control any Coding or Modifications Performed. No Responsibility is Assumed for Issues or Bugs Related to Microsoft Access for Any Reason, Including Future Updates, Software Incompatibility, Hardware Incompatibility, Hardware Failure, System Failure, or Data Loss Regardless of Circumstances or Reason. We Suggest that you Backup Your Systems and Data Regularly. Warrantee is Strictly Limited to the Initial Cost of the MS Access CRM Database Software Only. Contact Us with Any Questions You May Have or to Schedule a Free Demo via Remote Connection. We Will Walk You Thru All Features of the Software. 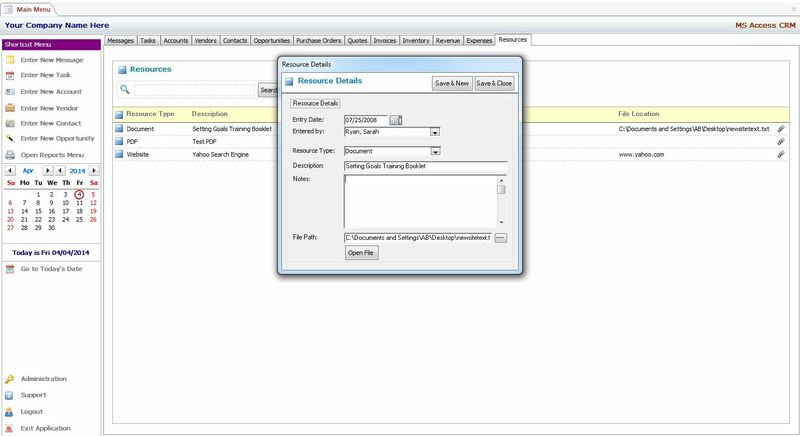 Although the MS Access CRM Database Template is Provided Ready to Use As-Is, Sometimes Clients May Have Special Needs or May Wish to Add or Remove Features or Reports. 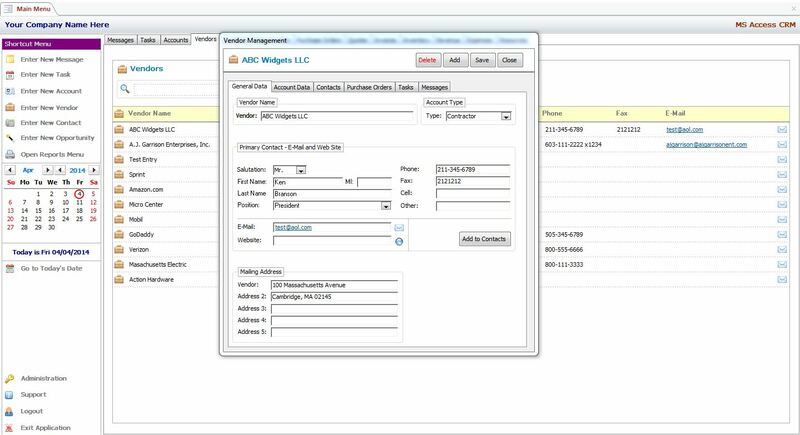 We Can Customize MS Access CRM to Your Specifications. Contact Us Using the Information Below. E-Mail Us, or Call for a Free, No Obligation Consultation and Customization Quote. 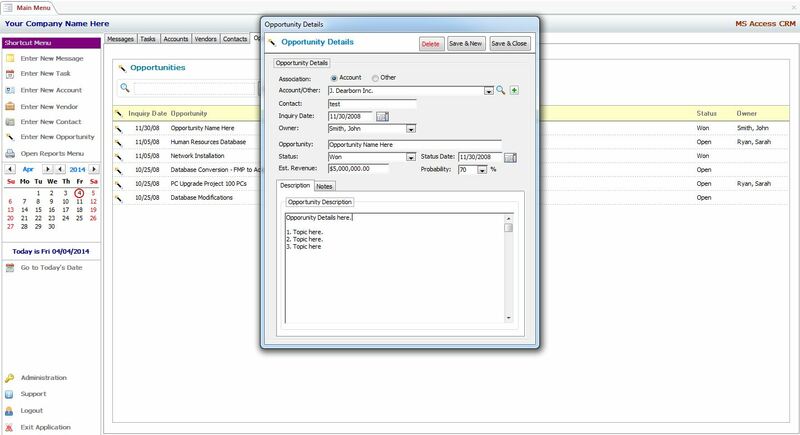 Do You Need a Sales Opportunity Management Application? Click Here to visit www.msaccesssalesmanager.com to See Our MS Access Action! Sales Manager Template - Designed to Manage Your Sales Contacts and Opportinities with Ease!